These delicious peanuts combine the rich flavor of everyone's favorite seafood seasoning with the crunchy good flavor of our premium peanuts. 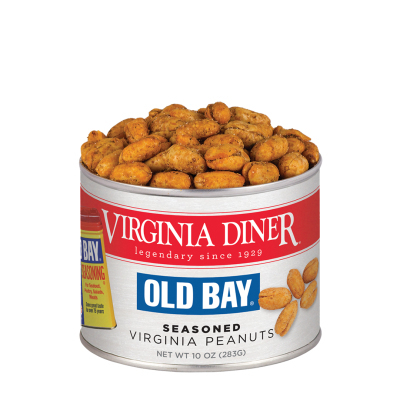 A tasty gift available only from Virginia Diner in 10 oz. tin. The product is second to none. I send them every year as client and family gifts at Christmas. 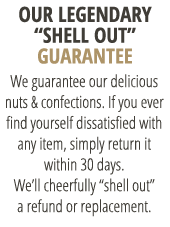 They are always a HUGE HIT and by far are superior to any nut I have very tasted and my recipients tell me the same every year. "Where did you get those amazing nuts?" Virginia Diner of Course, the Absolute BEST! I wasn't sure about these before I bought them. I had no idea what Old Bay was. I now know and I will be purchasing another batch. There is a slight bitterness from the celery seed, which at first makes these quite different. After the second handful, though, one just keeps going back for more. They are, as I said, strangely addicting.